When the local pathologist asks DI Lorne Warner and DS Katy Foster to attend the scene of an accidental explosion, it’s not long before the capable detectives find that the victim was murdered aboard his boat before the “accident” occurred. Delving into the victim’s past leads Lorne across the county border into Norfolk, where she calls upon her good friend DI Sally Parker to assist in the investigation. What the joint team reveals about the victim’s extended family blows them away. Can Lorne and Sally find the crucial evidence in time to prevent the notorious family from carrying out their own twisted justice to sustain their wealth? I was lucky enough to receive an ARC of this book from the author in exchange for an honest review. 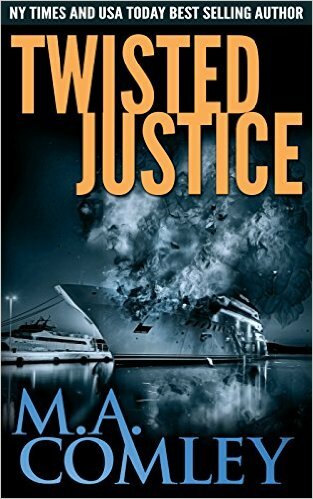 This is the thirteenth book in the Justice series and certainly did not disappoint! I read this book in a matter of hours, devouring each page as we see Lorne team up with an old friend, but relatively new character -DI Sally Parker. I had been dying for this pair to come together and needless to say…it bloody worked well! You may have noticed, I recently took on Claire Knight as a Guest Reviewer here on CrimeBookJunkie. You can imagine my surprise to see her turn up as the evil, calculating and very twisted antagonist in this book! Her character rocked!! And to be compared to the Unicorn, a previous nemesis, well you know she is pure evil! I will have to be sure I remain on Claire’s good side in the future! LOL! There was also a big squeal of joy from me when I came across my name in the book! This is the third time I have “appeared” from the dead….seems the author just cannot get rid of me (ha ha ha)! (insert ghostly laugh here) I love that M.A. Comley inserts her fans into her writing. Such a huge honour for us. A big thanks to the author for being…well…great!! Once again, the author takes us through a macabre tale of destruction which Lorne and the team have to figure out. I really enjoyed the plot of this book and suspect also that the little girl we have all nurtured as our own -Charlie – is now 21 years old and dating!! I suspect there will be a lot more about this in the next Justice book(s)! Would I recommend this book to my fellow readers….Ab-so-friggin-lutely! I am a HUGE. fan of the Justice series and now the DI Sally Parker series too! Having the two combined was brilliant and I hope to see the overlap again! So what are you waiting for?! The book is released on December 31st and available for 99p pre order. Get clicking #bookjunkies! Absolutely LOVED it Mel! Hope we see this pair together again in the future!! !